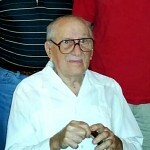 AUGUSTA, Ga. – Idelfonso Enrique Jimenez, 96, husband of 68 years to the late Blanca Rosa Gonzalez de Jimenez, of Dickey Rd, Augusta, Georgia entered into rest April 2, 2019 at Home. Graveside services will be held Friday, April 5, 2019 at 3:00 P.M. at Westover Memorial Park, Wheeler Rd., Augusta. Family and friends are requested to assemble at the graveside. Mr. Jimenez was born in Christo, Oriente, Cuba to Ildefonso Jimenez Sevilla of Jaen, Spain and Luisa Martinez Matilla of Almeria, Spain and was Catholic. He was preceded in death by his son Joaquin Alberto Jimenez Gonzalez. Survivors include his sons and daughters in law, Ramon Alfonso Jimenez Gonzalez, and Jorge Enrique Jimenez and Debbie Cawley (Jorge) Jimenez and Sheriann Justice (Alberto) Jimenez all of Augusta, nine grandchildren: Richard James, Wendy Lynn, Raymond Patrick, Michael Ramon John Thomas; Alejandro Barth; Albert Manuel, Tara Bianca, Geoffrey and nine great-grandchildren: Robert, Zachary, James; Mitchell, Gauge; Andrew, Ariana, Sullivan; Kaila, Jase, Emma Lee and Abby Lane. Idelfonso emigrated from Guanabacoa, La Habana, Cuba to Augusta, Ga. in 1962 along with Blanca, and sons. He and Blanca became US citizens in 1980. Idelfonso (Jimmy) retired from Wrenn Brothers in 1986 and lived at Dickey Rd. since 1969. Chance and Hydrick Funeral Directors, 2502 Richmond Hill Road Augusta, Georgia 30906.